This is the class to take if you want to learn — really learn — how to use your revolver to defend yourself and your loved ones. I take my knowledge of defensive shooting and my long experience with revolvers and put them together for the best defensive revolver course you’re likely to find. 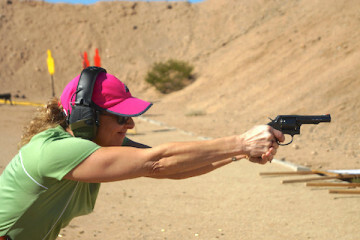 This two-day class, held at Phoenix’s Ben Avery Shooting Complex, is the best way for beginners and experienced shooters alike to start on the path to becoming revolver experts. Whether you’re new to the revolver or an old hand, you’ll learn a lot from this class — and come out with solid, relevant self defense revolver shooting skills! I’m being hosted by Phoenix Firearms Training; click here to go to their sign-up page for this class. I’m looking forward to seeing you in sunny Phoenix! P.S. : We can also arrange ammunition for you if necessary! Hey Buddy!, I found this information for you: "Time is running out — sign up now for my Threat-Centered Revolver class in Phoenix!". Here is the website link: http://www.grantcunningham.com/2017/03/sign-now-threat-centered-revolver-class-phoenix/. Thank you.